Cooked Wiltshire cured ham formed from selected cuts of pork leg meat, coated with a gluten free crumb. 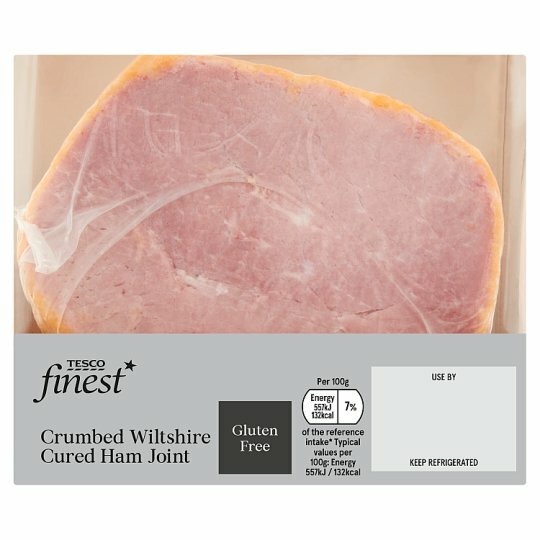 Tesco Finest Crumbed Wiltshire Cured Ham Joint Steeped in aged brine and hung on the bone to carefully mature. Rolled in a gluten free breadcrumb. Our Tesco Finest ham is prepared by a family owned business with almost 200 years of experience. The meat is cured using the traditional Wiltshire curing process, and hung on the bone to mature, before their skilled butchers prepare the joint. It's then cooked and rolled in a golden, gluten free breadcrumb. INGREDIENTS: Pork Leg, Gluten Free Breadcrumbs [Rice Flour, Maize Flour, Maize Starch, Salt, Colours (Paprika Extract, Curcumin), Dextrose], Salt, Preservatives (Sodium Nitrite, Potassium Nitrate), Pork Gelatine.